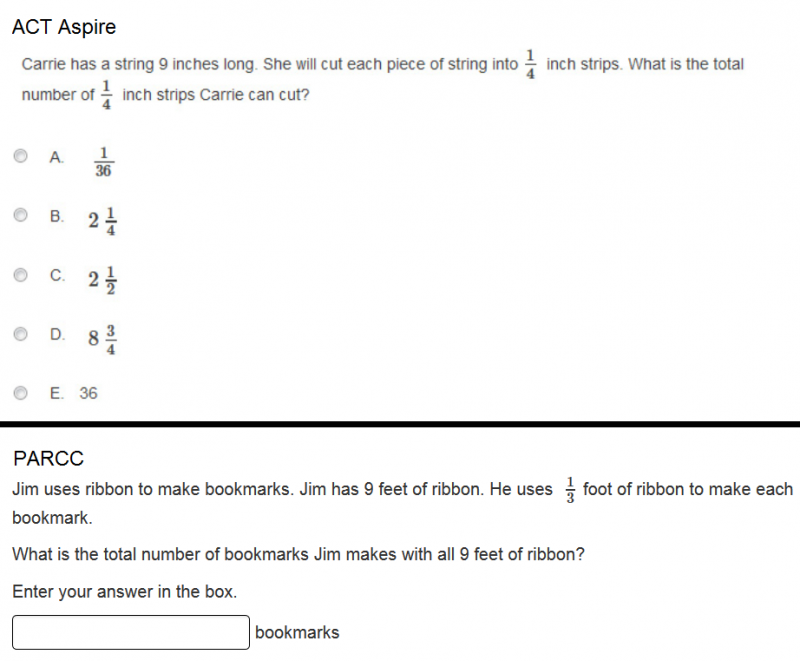 Could you answer these Common Core test questions? Forty-two states and the District of Columbia are now using the same math and English standards, but the tests they use to determine how well students have mastered them still vary significantly. One of the goals of the Common Core State Standards was to be able to compare student performance from state to state on a yearly basis. Five years ago, it looked like that would happen. Nearly all Common Core adopters were in at least one of two national consortia that would be creating new exams to accompany the standards, the Smarter Balanced Assessment Consortium and Partnership for College and Career Readiness, known as PARCC. Those numbers have dwindled. Just 20 states and the District of Columbia plan to give one of the two tests this spring. Others are back where they started: Using tests unique to their state. 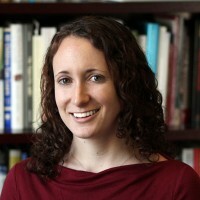 So even though, in theory, students in Connecticut, Wisconsin and Arizona are all learning the same thing, they’ll be measured differently. As always, when we’re talking about testing, there are caveats. 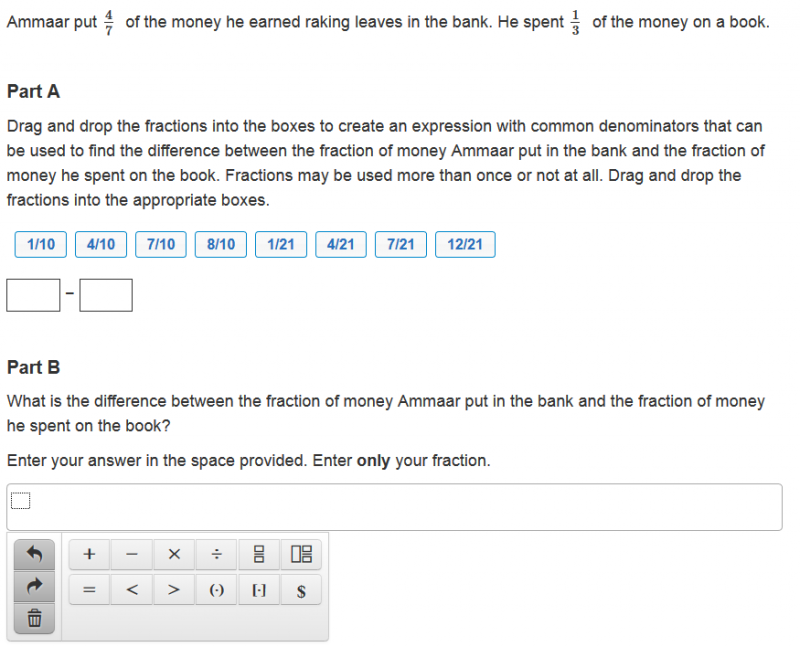 Even though all these questions deal with fractions, they may be testing different standards. They’re also a mix of actually tested items and sample questions. The sample questions never appeared on the tests but were published ahead of the exams to give teachers and students an idea of what to expect, and the actual test items were released after appearing on an exam last spring. In both cases, just because a type of question doesn’t show up here, doesn’t mean it wasn’t on the test – or won’t be on future tests. In other words, without an army of undercover fifth-grade reporters spying for us, it’s impossible to do a comprehensive comparison of the exams. Nevertheless, while we can’t draw conclusions about which test was best from this sample of questions, we can see some important differences in each one’s approach and how they differ – or not – from the old way of doing things. Let’s start with the obvious: whether a question is multiple choice. Smarter Balanced and PARCC are computer based assessments, meaning it’s easy to go beyond multiple choice and require students to type in open-response answers. The contrast is seen most starkly when comparing these questions from ACT Aspire, a paper-based test, and PARCC. It’s virtually the same question, but it’s much easier to guess the right answer on ACT Aspire than PARCC. That’s compounded by the fact that the correct answer on the ACT question, 36, is a clear outlier. “You don’t want the correct answer to stand out,” said Andrew Latham, director of Assessment & Standards Development Services at WestEd, which developed test questions for both PARCC and Smarter Balanced. If students understand enough to know the answer must be greater than 9, they don’t have to do any math to get the right answer, so the question doesn’t necessarily test whether they’re able to divide by a fraction. The test makers also made different choices about how many steps each problem would take to solve. 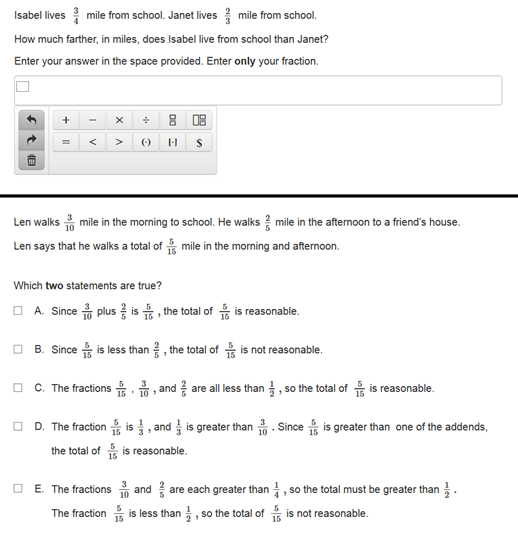 Look at these two similar questions from Smarter Balanced and Wyoming’s state exam. The Smarter Balanced question only requires one step to get the right answer, dividing 2 by 1/5. 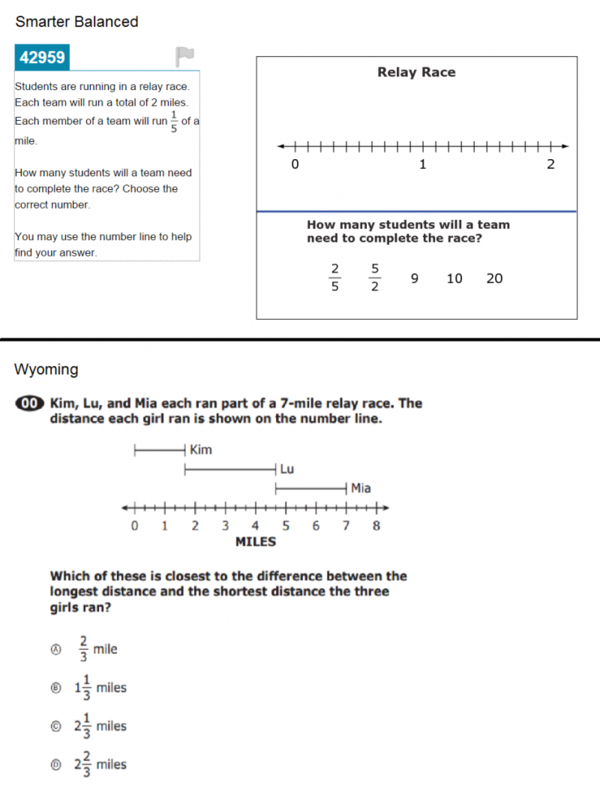 To get Wyoming’s test question right, students first need to be able to use the number line to figure out the shortest and longest distances before they can do the rest of the math. “If you can’t read a number line, it doesn’t matter if you can subtract fractions or not, you’ll get it wrong,” Latham said. Phil Daro, one of the lead writers of the Common Core math standards, pointed out that students are asked to do multistep problems in the classroom, however. “You have to have them on the test,” he said. Of course, paper-and-pencil tests don’t only rely on multiple-choice questions. They’ll also include open response questions, like the New York examples, where students are given a standard word problem and asked to show their work before writing down an answer. These questions take more time and money to grade, and are more prone to human error while grading, but there are pluses. Like the write-in answer on the above PARCC example, short answer math questions eliminate students’ ability to guess with the added benefit of allowing students to get partial credit, if they set up the problem correctly but make an error adding two fractions, for instance. PARCC sometimes mimics that process with a question like this, which requires students to first write out the expression they’d use to find the answer. Regardless of whether a question is multiple choice or open response, clarity matters a lot. That’s a particularly important consideration on math tests, where you run the risk of a student getting a question wrong because of weak reading skills rather than weak math skills. The range of ambiguity in question phrasing is highlighted by these two PARCC items. Read more about Common Core.